Spring has officially arrived. For some of us, this means only one thing: time to update the wardrobe! If you’ve found yourself singing this refrain, you’re in luck. The Spokane region is chock-full of shopping. Whether you’re looking for clothing from the hottest brands or a unique ensemble from a local boutique, you’ll find it in the Spokane region. Locally-owned boutiques are popping up all over Spokane, offering shoppers limitless selections on items they won’t find anywhere else. Those looking to spruce up their spring and summer wardrobe with some fresh, trendy items should check out Jema Lane Boutique in Spokane Valley, or Lolo Boutique in downtown Spokane. For a full list of boutiques in the Spokane region, click here. You’ll find all of the season’s hottest styles in Spokane’s major retail locations. 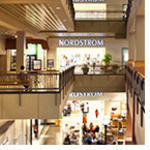 For shoes, clothing, makeup and everything in between, check out Nordstrom, located in downtown Spokane. Fitness enthusiasts will want to check out Runners Soul for fitness gear and the newest running shoes. For a full shopping directory, click here. If you plan to turn your shopping excursion into a full-on shopping adventure, you’ll need a headquarters to stow your new purchases. Fortunately, the Spokane region has hotels aplenty! For hip, artsy hotels located in the heart of downtown, check out Hotel Ruby, Ruby2 or the Montvale Hotel. 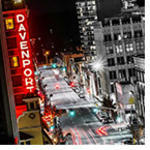 For the deluxe experience, try The Davenport Grand, The Davenport Tower or The Historic Davenport Hotel, a Spokane icon. Looking for something a little more quaint? 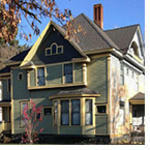 Try the 1899 House Bed & Breakfast or Marianna Stoltz House Bed & Breakfast. For a complete list of hotels in the Spokane region, click here. This beautiful photo of downtown Spokane was shared with us by Instagram follower @endlessreflectionphotography. All this shopping will make you hungry! You&apos;ll find all of Spokane&apos;s best restaurants by clicking here.